Vietnam has this year welcomed more than 6.84 million foreign visitors, a year-on-year rise of 9.5%, with arrivals from traditional markets remaining high. The number of international arrivals in the nation this year is 340,000 higher than earlier estimated by the tourism industry. However, the 2012 growth rate at 9.5% is lower than the 19.1% in 2011 over 2010. China and Russia are the two markets showing considerable changes in 2012. China has still captured the top position, but arrivals from the neighboring nation in 2012 have increased a mere 8% year-on-year to 1.4 million, while the growth rate last year was a staggering 56.5%. The Russian market only ranks 12th among the top visitor-generating markets but the number of tourists from this market has jumped 71.5% year-on-year to more than 174,000, most of them coming for short-term holidays in coastal cities. At the moment, flights connecting Russia with the central coastal province of Khanh Hoa or HCMC are operational almost every day to serve Russian visitors on their winter holidays. Many provinces have announced the 2012 reports on international arrivals. According to the HCMC Department of Culture, Sports and Tourism, the city this year has welcomed some 3.8 million foreign tourists, a rise of 10% over the year-ago period. The central province of Binh Dinh has seen over 341,000 international arrivals, soaring 13.5% over 2011. 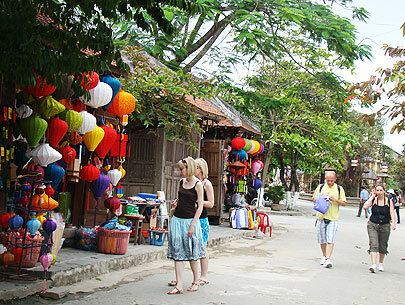 Khanh Hoa Province reported 528,000 foreign travelers in the locality, marking up nearly 20% year-on-year, while the northern province of Quang Ninh has recorded around 2.4 million foreign visitors.